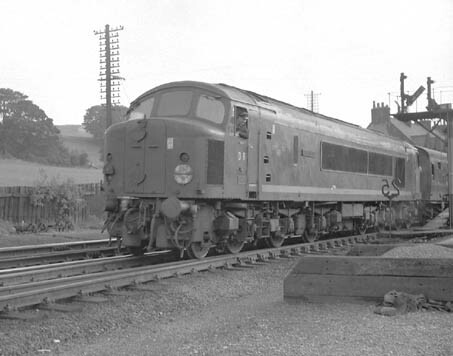 For the purposes of this text the Derby built BR/Sulzer Type 2's D5000 - 5019 are referred to as the Class 24's; the BRCW built Type 2's D5300 - 5319 as the Class 26's, the Derby built Type 4's D1 - 10 as the Class 44's and the later Derby (& Crewe) built Type 4's D11 - 137 as the Class 45's. Unless otherwise stated all photographs are the copyright of Colin Williams. The first Sulzer diesel engines were constructed for use in stationary applications. It was not until May 1905 that a Sulzer diesel engine was installed with propulsion in mind, in a canal boat belonging to the Leeds - Liverpool Canal Company. It was a 30hp two cylinder four stroke 2D15 engine, it was not considered a success. Technological advances soon cured the shortcomings of these early engines and by February 1913 Sulzer had its first licensee in the United Kingdom, William Denny & Brothers of Dumbarton. The First World War delayed further licensees in the UK, not until September 1919 did W G Armstrong, Whitworth & Co Ltd became the second licensee. The early 1920's saw a series of famous names added to this list, in May 1934 Sulzer Brothers opened their first office in the UK, in London. As detailed elsewhere it was Armstrong Whitworth (AW) that introduced the UK to Sulzer powered rail traction, building twenty nine Sulzer powered diesel-electrics between 1931 & 1937, with sixteen working in the UK. After AW discontinued its rail traction department further development in the UK was stalled until 1949 when Sulzer entered into a working relationship with Vickers - Armstrongs (Engineers) Ltd, Barrow in Furness. The CIE would introduce the first mainline Sulzer powered locomotives to the UK/Eire with two 915hp machines built at Inchicore in 1951. A further twelve followed in 1956/57, with the power units built by Vickers Armstrongs, Barrow, their first. 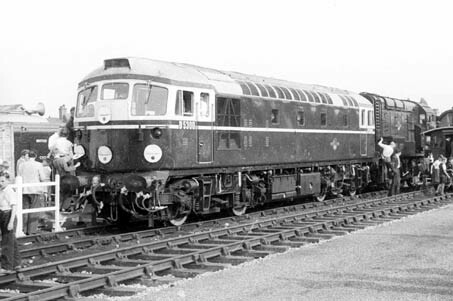 With British Railways touting its 1955 Modernisation Plan, which included the building of 171 diesel powered 'prototypes', the tender forms were received from individual builders and consortiums alike. From this beginning Sulzer generally aligned itself with Vickers Armstrong, Birmingham Railway Carriage & Wagon (BRCW) and British Railways (Workshops) in fulfilling its obligations. 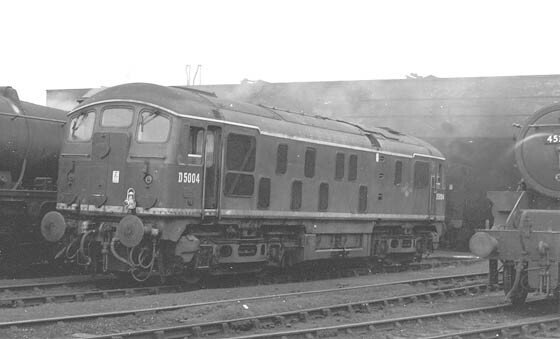 These obligations materialised firstly in July 1958 with the delivery of D5000 from Derby and in September 1958 of D5300 from BRCW Smethwick. In promoting the new motive power an exhibition was held at Wood Green. 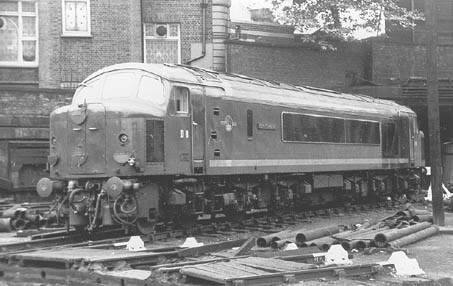 Seen here is the first of the BRCW Type 2's (later Class 26's), D5300 on display in original condition. The London offices of Sulzer Brothers were located at Bedford Square (off Tottenham Court Road), employing about twenty staff led by a Mr T Schur. They comprised a small design team, a sales & spares section, with Colin employed as a design draughtsman. Sulzer had other offices in the UK, at Basingstoke (weaving machines), Leeds (large pumps) and Duxford's (marine diesels). Colin was also involved in the production of the A5 size operating manuals provided to the train crews and the A4 size maintenance manuals given to the depots for use by the servicing staff. No detailed locomotive designs were done here since Sulzer was only a sub-contractor to the locomotive builders (BRCW, Smethwick & BR Derby). However design studies were done when tenders went out for new locomotives. Designs for a small number of engine related components were occasionally prepared, one such item was a thermostat controlled, hydraulicly operated cooling water bypass valve. Another task was a layout & design project for diesel hydraulic locomotives, in the lost hope that the Western Region might use Sulzer engines! Outstationed at the main contractors workshops were Sulzer's Swiss engineers, at BR Derby/Darlington/Crewe & BRCW Smethwick. They were on hand to deal with any problems and would often be joined by others as issues arose. As the locomotives went out into service several of the larger sheds received a semi-permanent Sulzer engineer to monitor and resolve the day to day running issues. As more locomotives were delivered Colin moved to the 'outdoor' staff, a previous apprenticeship at Crewe Works being a useful platform for this change of tasks. In addition further courses were completed including Class 24 electrical systems at Selhurst, engine installation at BRCW Smethwick and turbochargers at De Havilland Engines. In the field Colin worked at Hornsey & Hither Green, then moving to Vickers Armstrongs, Barrow as the engine production increased, working alongside the resident Swiss engineers. This move north also required travel throughout the north of England (especially to Darlington) to troubleshoot and advise. As a roving troubleshooter for the London area Colin encountered many of the teething troubles thrown up by the Class 24's at Hither Green and the Class 26's at Hornsey. Resident depot engineers at this time were Eduard Scharer (Hornsey), Walter Rechenmacher & Kirt Baier (Hither Green) and Haus Hohn (Stratford). 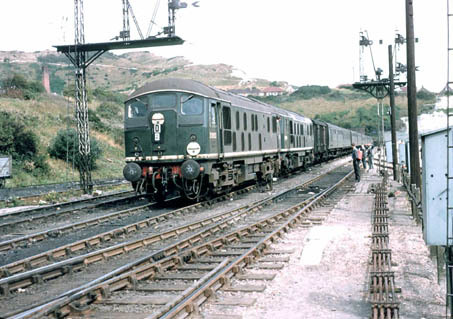 Colin acted as co-ordinator for the three sites, often being out on-the-road in the locomotive cabs checking engine statistics during service and documenting any irregularities. Typical of the above was monitoring the Class 26's working on the Kings Cross - Cambridge services, specifically the engine temperature versus throttle opening (circa 1959). Seen here at Cambridge (sometime in 1959) is D5316, Colin was travelling on the locomotive to monitor various readings. On August 26, 1959 a trip was made in the cab of D5305 on a semi-fast Kings Cross - Cambridge working to check the operation of the radiator cooling fan after some adjustments had been made. With a load of seven coaches (270 tons) Royston was reached in seventy minutes, with stops made at Welwyn Garden City, Stevenage and Hitchin. Maximum speeds attained were at Brookmans Park (68mph) and Ashwell (67mph). Recorded coolant temperature was 158F at Kings Cross, quickly climbing to 173F when passing Harringay. For most of the remainder of the trip the temperature stayed in the 160F to 170F range, the lowest recorded was 157F, obtained at the end of the two minute station stop at Stevenage. Generally the cooling fan remained on full power whilst the water temperature stayed above 166F, below that it would drop to half power, though the position of the engine throttle had a determination on the fan speed. One of the first problems to manifest itself was that a number of piston ring heads became loose from the main piston body. The rings were shrunk on to the piston body to accomodate oil pressure passages behind the rings. This failure required a complete fleet change of pistons on all locomotives so far delivered. It was a major exercise to remove the piston so the Hornsey locomotives were dealt with at the better equipped Stratford workshops. Colin's notes indicate that the order at Stratford was 5301/04/05/07/08/06/00, with a visit being made on August 6th 1959 to check on the spares availability, not only for the piston change but also for modifications on the governor gears and lubricating pump gears. To accomodate all these tasks a small workshop was set up in East London to assist in the modifications and maintain an inventory of these modified spares, Colin remembers making many trips to Hither Green with lorry loads of the modified pistons. Following on from the piston problem came the troubles with the load regulator diaphragm. This component converted the air pressure from the driver's controller into the load regulator settings required to control the engine power output. In service the diaphragms started to split preventing power from being applied, or if the engine was under power it would return to idle. This again required a fleet change for this component, unfortunately the new composition replacements weren't immediately available, thus the problem persisted for awhile. Colin remembers a visit to Ipswich depot after receiving an urgent call from the shed foreman that a Class 24 had failed with an un-diagnosed fault. On arrival he found the depot staff had exposed the entire pipe run located under the engine room floor, the depot staff having reasoned correctly that the air supply was the culprit and that (incorrectly) the fault lay somewhere in the pipework leading up to the load regulator. After removing the six bolts that secured the governer lid, the problem was quickly revealed; as expected the diaphram had split. It was left to the depot staff to return the engine room floor to its proper state! On a visit to Hornsey another problem lay with a Class 26 that could not be started and was making a nasty noise. The front engine end cover was removed to discover that the large gearwheel bolted to the front of the crankshaft had become detached. This was a simple engineering mistake, one that should not have been made by such a reputable company as Sulzer. (There were forty 'Pilot Scheme' Sulzer powered Type 2's, twenty Class 24's and twenty Class 26's. The production of the power units was split, ten came from Winterthur and thirty from Vickers Armstrongs, it's probably still conceivable to track down the origin of this power unit.) Four studs and nuts secured the gearwheel to the crankshaft, the nuts being secured with split pins, this in effect turned them into bolts that had unscrewed. The answer was relatively simple, especially for someone who'd taken National Service in the RAF, where all nuts were secured with locking wire rather than split pins. A piece of wire was passed through each split pin hole in the studs and nuts, passing through all four studs, then twisting the wire ends together, thus preventing any stud from coming loose. The Type 2's shown here are 5003 & 5004, close investigation of the photograph reveals they have had their boiler water tanks removed, as one of the measures taken to reduce their axle loading whilst working on Southern metals. A Move North to Barrow. By the end of 1960 the production of Sulzer powered locomotives was in full swing. BR workshops at Derby, Crewe & Darlington were delivering Type 2's, BRCW Smethwick was producing Type 2's & 3's whilst Derby (& later Crewe) was settling into its Type 4 orders. With these locomotives literally being delivered to all parts of the country it had become very obvious that the training of shed staff was now a high priority. Much of this training was to be carried out at Vickers Armstrong, Barrow and Colin became the ideal candidate for this task based on his broad experience of BR training and his hands-on work at Hither Green and Hornsey. And so a move was made north to Barrow, to assist the resident Sulzer engineer already there, to deal with problems in the northern part of the country and to establish the training programme. The training programme was intensive, it had to be to improve availability of the newly delivered locomotives and to minimise failures in traffic. From the Midland, Eastern & North Eastern regions came groups of six or seven Mechanical Foremen and senior fitters for two weeks of intensive training on all three types of engines then under construction. These were the 6LDA28, 8LDA28 & 12LDA28 power units, at the time the training began the up-rated 'B' variants were not yet in production. 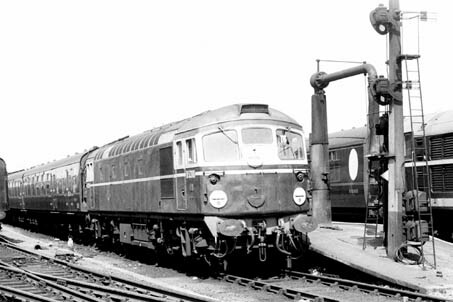 The training proved to be a challenge, humorous at times, as the intricate nature of diesel engines required the cleanest of conditions when being serviced, whilst reality was that most of these early diesels endured a steam shed environment full of ash, cinders, poor lighting and the most basic of tool kits. Photographer unknown at this time The challenging servicing conditions for the new diesels are exemplified here in this vintage steam era view of D5004. The ash, soot and cinders of the neighbouring steam locomotives no doubt eventually found their way into much of the diesel's inner workings, particularly so when covers and hatches had to be removed for servicing. This view of D5004 reveals its 'as delivered' condition. It is one of the few to carry the split level frost screen, it carries the extra ventilator on the upper row (five instead of four), and is yet to be adorned by any yellow warning panel. After arriving at Barrow Colin's first call-out was to Carnforth shed to rectify a split governor diaphragm, a problem familiar to the Sulzer engineers in the field, but one likely to baffle a freshman diesel fitter. Other faults encountered were easily fixed and revealed the inquisitive nature of shed staff not familiar with their new charges. A call had been received from Carlisle Upperby shed where one of the new Type 4's, D6 had been reported low on power. Each cylinder of the 'LDA' unit was fitted with an individual fuel pump, that could be isolated by moving a small sliding bolt found at the base of each pump. When surveying the problem with D6 the answer proved to be very simple, five of the fuel pumps had been isolated, within a minute the low power problem was corrected! A similar call out presented Colin with a locomotive that would not start. In this case the overspeed trip had operated, and simply required the overspeed trip bar, fitted to the bodyside, to be used and the problem was solved. Because of these types of faults Colin visited Upperby once a week to supervise maintenance and provide instruction to shed staff. Once over Shap the speed rose to 85mph with the engine idling! From the RCTS archives (Kevin Hughes photo HU00402) comes this period view of D6 'Whernside' pulling away from Oxenholme with a service to Carlisle on September 21st 1961. The WCML would soon become the forte of the EE Type 4's and, later, the Brush Type 4's. The 2,300hp Class 44's would soon begin their long association with Toton, the majestic Lakeland fells giving way to the coalfields of the East Midlands and the varied industry of the Birmingham area. Nothing unusual was recorded until shortly after passing Tring when the blue warning light on the driver's console lit up. A quick foray into the engine room revealed all was not well. Water temperature was at 188F, oil temperature had reached 186F and oil pressure had dropped to 26psi. An immediate request was made to return the engine to idle and to stop the train as soon as possible. This was done at Kings Langley, though even before the engine could be shut down there was an almighty bang from the engine room. The driver, second man and Colin beat a hasty retreat to the safety of the station platform, prior to returning to the now silent engine room to investigate the trouble that had befallen D4. It was soon obvious that a crankcase explosion of some sort had occurred at 22.25. Rescue arrived fifty minutes later in the shape of a steam locomotive, with final arrival in Euston at 23.48. The next morning Colin was on the carpet explaining to his boss why the crankcase explosion had been allowed to occur whilst a Sulzer representative was aboard the locomotive. The detailed monitoring of the engine readings and the prompt action taken upon the response to the warning light on the driver's console cleared Colin of any negligence. Due to the considerable damage sustained, D4 was taken to Derby Works so that the power unit could be removed and stripped down for examination. The reason for the crankcase explosion took a little time to resolve. The main generator had induced a magnetic field in the output shaft & gear that engaged with the two crankshaft gears. This in turn attracted all the minute ferrous particles in the circulating oil into the shaft bearings. This caused the bearing to overheat, raising the oil and water temperature, the latter via the oil/water heat exchanger. As the hot oil started to fume an explosive mist was generated within the confines of the crankcase, leading to the inevitable explosion. The later fitting of a safety device to the crankcase cover to vent such forces minimised similar future problems. Photographer unknown at this time Its July 24th 1960 and an almost new D8 'Penyghent' stands at Camden. With Colin focused mainly on the Type 2's he surprisingly made few trips to Derby Works, principally making visits there whilst the early Class 45's were under construction. The resident Swiss engineer was unfamiliar with the layout of the 'Peaks' so visits were made to resolve minor installation issues, including matters relating to the pump set and the radiator thermostat valve. Colin was also in attendance during the load bank tests prior to the locomotives being released into traffic. full regulator producing 1,900 amps. North of Settle with full power applied a test of the Deadman's apparatus was successfully carried out. At Selside on the 1:130 grade the balancing speed was 51mph with 1950 amps, the instrument readings being almost identical to those on the D4 Carlisle - Euston trip. The remainder of the northbound run to Appleby produced little out of the ordinairy. After running round here the trip continued without incident until approaching Settle. Whilst slowing for a permanent way speed restriction the combined brake valve fitting came apart in the driver's hand! A certain air of panic filled the cab of D11, most certainly the training courses that the driver had attended did not cover this eventuality. Colin's suggestion to release the Deadman's device brought about the desired brake application. With the train now stopped an investigation under the driver's console revealed that the securing device for the combined brake had come apart and could not be fixed in-situ. The thoughts of another main line failure (after the crankcase explosion on D4) being chalked up against Colin created much thought for a solution on how to get the train back to Leeds. After discussion with the train crew and a check of the locomotive to ensure no other faults were apparent, it was decided to return to Leeds at reduced speed using the still operative locomotive air brake to control the train. Regrettably I have lost touch with Colin so it looks like the story will never be completed, sorry! An un-official view of almost ex-works D5094 and the men of Darlington Locomotive Works who constructed the first mainline diesel-electric to be built here. Quite what the photographer was trying to capture in this view is uncertain, perhaps the several steam locomotive boilers seen here in a corner of Darlington Works, date unknown. However also captured in this view is the cab structure of a Class 24, which for reasons unknown drew your webmaster to this picture. Its presumed this cab has not yet been fitted to a locomotive and is only partially completed.